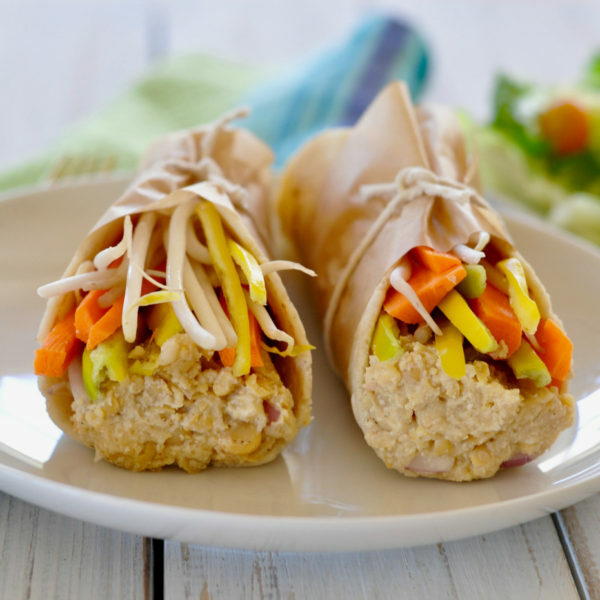 This rich, creamy and tangy vegan chickpea salad sandwich will satiate any palette. 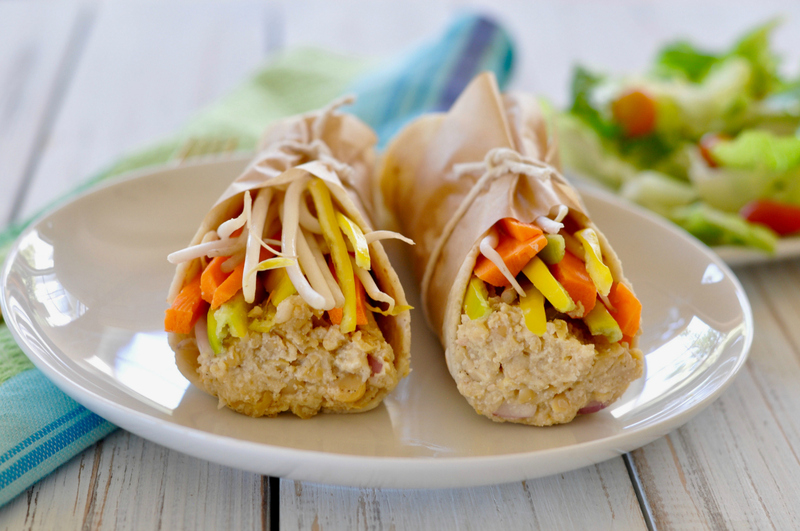 Loaded with healthy ingredients and high in protein. Chickpeas, also known as garbanzo beans, are a versatile legume that blends well into a variety of dishes. In today's vegan chickpea salad sandwich, I processed the chickpeas into a smoother texture, but still maintaining some chunkiness. The Caesar dressing is a luscious combination of cashews, dijon mustard, lemon juice, and some liquid from a can of artichokes to add a brine element. Make sure your artichokes are in water brine and not oil brine for this recipe. I also liked the idea of using tortillas for the vegan chickpea salad sandwich instead of bread. Tortillas are great because they freeze well and don't take long to thaw. You could also place this yummy mixture on top of some greens for a fresh, new, salad idea. If you love chickpeas as much as I do, I know you will enjoy a few of Ordinary Vegan's most popular recipes like my Moroccan Vegan Stew with Chickpeas, Sweet Potatoes, Spinach & Raisins, Vegan Meatloaf with Chickpeas & Tomato Maple Glaze and my Chickpea Stew with Yams, Spinach, Lemon, Mint Leaves & Red Pepper Puree. Thanks for joining me today and I hope you enjoy today's plant-based recipe. Are you going to try this recipe? Please let me know! Leave a comment, rate it, and don’t forget to tag a photo #ordinaryvegan on Instagram. Don’t miss any of Ordinary Vegan’s FREE recipes by signing up here. Learn more about plant-based nutrition and how to get started on a vegan diet, Ordinary Vegan has a podcast. You can listen here on this website or in iTunes. 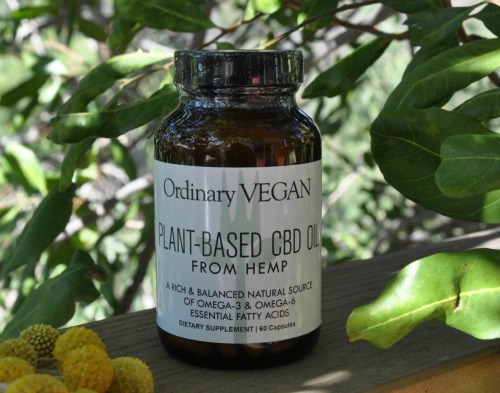 You can learn more about vegan CBD oil from hemp here. Please don't hesitate to reach out to me with any questionsÂ you may have at questions@ordinaryvegan.net. Add all the ingredients to a food processor and process until smooth adding more water if necessary. It should have a mayonnaise or thicker consistency. Taste and adjust the seasonings. Remove from food processor. In the same food processor (doesn't have to be washed) - Add the chickpeas and give them a few pulses to mash them. Put the chickpeas mixture in a medium bowl and begin adding some of the dressing tasting as you go. You will probably have leftover dressing which you can use on a salad or some fresh sliced tomatoes. You don't want to overdress the chickpeas. Divide the chickpea mixture between the tortillas. Top with carrots, peppers and sprouts. Roll up and serve. What substitution could I make for artichoke brine? I do not like artichokes, and would not buy a can just to use the brine. Hi Margaret – Do you eat baby jackfruit? That comes in a can and could make a good substitute. Here is a nice recipe for baby jackfruit barbecue after you use the brine. This was delicious. I substituted Damascus Bakeries All-Natural Roll-ups, Flax as a lower carb and bit more diabetic friendly option. Thank you for this recipe…well, and others that I’ve used.